Setup Factory has been raising the bar for over a decade. It's compatible with Windows XP SP2 through Windows 10. We've added native 64-bit runtime support, additional compression options, updated scripting engine, and enhanced build configuration support. Of course, we're true to our roots; we still make the easiest to use installer builder available anywhere. But now, it's one of the most powerful solutions as well. Setup Factory is a sophisticated tool that gives you complete control over the installation process. Full-featured, fast, and easy to use, Setup Factory's intuitive design maximizes your ability to deploy software products, data files, graphic images, or anything else that you want to distribute. Setup Factory creates single-file, compact, and bulletproof professional software installations. Its visual design environment makes it a snap to assemble your files, customize the wizard interface, add runtime support modules, and package your software for deployment via diskette, CD-ROM, LAN, email or Web. Since its first release, Setup Factory has defined innovation in Windows based setup and installation tools. Over the years, the product line has been the recipient of numerous awards, accolades and glowing reviews. Thousands of software developers trust Setup Factory to distribute their software to millions of customers and clients around the world. While others have tried to imitate it, only Setup Factory offers such a perfect combination of ease, flexibility and control. As development of native 64-bit applications continue to grow, take comfort in the fact that Setup Factory has you covered for your distribution needs. Setup Factory now allows you to generate 64-bit setups in addition to 32-bit. Whether you have 64-bit applications ready to go, or just want to be prepared for the future, Setup Factory will be ready and waiting to make your life easier. With Setup Factory 9's improved LZMA data compression LZMA2, you'll see remarkably smaller installers as well as faster installation performance than ever before. Take advantage of the power of modern CPUs with its enhanced multithreading support. Compared to previous versions, our test results show up to 300% better compression performance and at least 20% faster installation speed. You'll be able to fit more on each CD/DVD (that’s a potentially huge manufacturing cost savings) and reduce your bandwidth for Internet distributed installers (that saves both you and your customers time and money). Additionally, customers will notice that your installers finish faster - and that means happier customers! Every second counts when it comes to development time. Significant improvements have been made to Setup Factory 9's build process meaning that you'll spend less time building and more time developing. Setup Factory's scripting engine is now faster, more powerful and much more extensible. The Lua 5.1 system features incremental garbage collection, new mechanism for varargs, new syntax for long strings and comments, mod and length operators, metatables for all types and a fully reentrant parser. Action Plugins are one of the best features of Setup Factory. They allow 3rd party software developers to extend and expand the product in an extremely integrated and seamless fashion. By simply dropping a plugin into your project, you can easily save yourself hours of work and add significant functionality to your setup. The great news is that with Setup Factory, plugin developers can now fully leverage the advantages of the Lua 5.1 language. The Plugin SDK v2 is available for free download on the indigorose.com website. The new billboard control allows you to incorporate billboards or static images on your custom screens and custom progress screens. Billboards can be used to show both single images, and image slideshows at any point in the setup, even while installing or uninstalling files. Previous progress screen types limited the types of controls you could add. The new custom progress screen gives you the freedom to design your own progress screen with any type or number of controls you wish. If screen real estate is important, no need to worry! Setup Factory now allows you to create screens of any size through its enhanced theme settings. Screen sizes can be controlled project-wide through it's theme, or overridden on a per-screen basis. Setup Factory 9 gives you the freedom to create setups that look exactly the way you want. Perhaps you prefer that your setups take on the same appearance as the operating system (e.g. Windows XP, Vista, Windows 7 Aero, Windows 8, Windows 8.1, Windows 10)? Or perhaps you'd like to simply make use of the hundreds of ready-to-use MSSTYLES themes (like OS/X Tiger and Panther) that you can download on the Internet? In any case, Setup Factory makes it possible – and easy! A powerful new action named "File.SetPermissions" allows you to set the user access permissions of any file or folder on the user's system. Building multiple installs from one Setup Factory project has become even easier in Setup Factory 9 with the addition of Dependency Modules and Plugins to build configurations. This helps to make developing 32-bit and 64-bit installations within the same project file a breeze. We've improved the Add Files dialog on Windows Vista, Windows 7, Windows 8, Windows 8.1 and Windows 10 to give you the options that you would expect on those operating systems, including the search option and your favorite links. In addition to the classic modules like Visual Basic 5.0/6.0, – Setup Factory now includes easy-to-use runtime dependency modules in both 32-bit and 64-bit for the newest and most popular technologies like .NET 4, Visual C++ 2010 and Windows Installer 4.5. Upgrading to Setup Factory 9 is almost completely hassle-free. Simply open up your Setup Factory 7.0 / 8.0 project files and continue development. See the Changes to Setup Factory topic for information about minor changes that may be required. Install Any File – Anywhere! Setup Factory features an unbeatable development environment that puts you in control of your files. Simply drag and drop your files and folders onto the project window and you’re ready to build. Setup Factory is smart enough to maintain your folder structure, automatically query version resource information, create shortcut icons and ensure 100% data integrity with reliable CRC-32 checking. Of course, everything can be customized and overridden if you wish, but for most projects the improved Project Wizard can handle it all with just a few clicks. Smaller and faster means a better experience for your customers and Setup Factory delivers. With no "unpacking" step required, Setup Factory installers are much faster to initialize and install than those created by competitive tools. What’s more, our Publishing Wizard walks you through the build process with a few easy steps. The single-file setup.exe is ready for distribution by web, email, LAN, CD and DVD. Spend five minutes with Setup Factory's easy to use Project Wizard and come away with a complete, ready to build installation project. You'll be walked through each option so you can get your project started as quickly as possible. With a library of more than twenty different screen templates to choose from and a pre-built wizard sequence suitable for the majority of installation tasks, Setup Factory is miles ahead of both previous versions and the competition. There are pre-built layouts to handle just about any task your installer could want, and it’s easy to adjust them to fit your needs exactly. There's everything from check boxes, radio buttons and edit fields to popular screens like license agreements, serial number verification, shortcut folder selection and other advanced options. The Screen Manager allows you to add and remove screens at will and adjust the sequence with a simple drag-and-drop motion. Each screen features a real-time preview so you can see the result of your changes as you work. Choose from dozens of pre-made themes (skins) for your screens or even make your own. It's as easy as viewing a live dialog preview and picking your favorite style. You can configure everything from fonts (face, color, size, style) and banner images to body/background graphics, control colors (buttons, check boxes, radio buttons) and more. Whether your installer needs a corporate feel or a hip attitude, you can do it with Setup Factory! 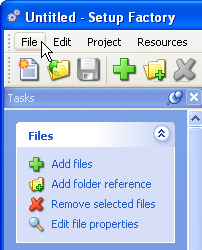 Previous versions of Setup Factory have included a handful of system actions for doing routine tasks such as running programs and creating shortcut icons. Setup Factory takes it to another level and gives you full control over your installer. You get a built-in library of 385 easy to use actions, so you can do whatever you need without having to be an advanced programmer. There are actions to handle everything from text file editing to system registry changes. You can execute programs, call DLL functions, query drive information, manipulate strings, copy files, enumerate processes, start and stop services, interact with web scripts, display dialog boxes and much more. You don't have to be a wizard to create powerful installers with Setup Factory. We've built the wizard into the software! Simply choose the action you want from a categorized list (complete with on-screen interactive help), fill in the requested information fields and the wizard does the rest. You don't have to know anything about scripting or programming – just fill in the blanks and you're done. Making changes is just as easy. Click on the line you want to change and press the "edit" button to go back to the original form. It's really that easy. Setup Factory incorporates an incredibly powerful free-form scripting engine. Based on the popular LUA language, this easy to understand scripting language features everything from "for, repeat and while" loops, to "if/else" conditions, functions, variables and tables (associative arrays). Paired with the built-in action library, full mathematical evaluation and Boolean expressions, there's simply nothing you can't achieve. Of course, we've also built in an "Action Wizard" and "Code Wizard" so even complete novices can create powerful installers that handle even the most demanding installation tasks. If you've outgrown the Action Wizard interface or simply want to unleash the power of the fast and efficient scripting engine, we've got you covered. The Setup Factory freeform action editor features all of the professional features you'd expect. There's color syntax highlighting, code completion, function highlighting, as-you-type action prototypes, Ctrl+Space function listings and even context-sensitive help. If you're used to programming in MicrosoftÒ Visual Basic, MicrosoftÒ Visual C++ or any other modern development language, you'll be right at home. Setup Factory can be easily expanded with Action Plugins. These plugin modules can extend the product in infinitely powerful ways, such as adding support for databases and FTP file transfers. Tight integration with the design environment – including IntelliSense style code completion and syntax highlighting – makes them just as easy to use as built-in actions. Plugins are available through Indigo Rose as well as third-party developers thanks to Indigo Rose's freely available plugin development kit. Instantly add runtime support for many popular third-party technologies, including Visual Basic 5.0, Visual Basic 6.0, .NET 3.0, .NET 3.5, .NET 3.5 SP1, .NET 4, SQL Express 2005, Visual C++ 2008, Visual C++ 2008 SP1, Visual C++ 2010, Windows Installer 3.1 v2, Windows Installer 4.5, and more. Additional dependency modules are easy to create and integrate seamlessly into the development environment. Setup Factory gives you complete control over the detection and installation of each module, so you can easily adjust the behavior to suite your particular requirements. Setup Factory features a powerful uninstall feature. Simply turn it on and let Setup Factory worry about removing your files. Anything that is installed during the setup will be marked for removal by the uninstaller. However, if you want to go in and tinker with the settings, you'll find that the uninstaller is fully customizable. You can take full control of what files are removed, what shortcut icons are deleted, what registry changes are made and anything else you require. Even the dialog screens and sequence can be adjusted to suit your needs! You can easily enforce system requirements just by clicking a few boxes. Built-in checks include operating system, memory, screen resolution, color depth and administrator privileges. If the user's system does not meet the minimum requirements you have chosen, the installer can either warn the user or abort the setup entirely. Setup Factory includes a variety of features designed to help you manage access to your software, including serial number lists and date-based expiration. With its powerful serial number generator you can quickly create thousands of unique serial numbers, which are stored internally as secure MD5 hashes. Hidden from prying eyes, your installer data is compressed using proprietary algorithms and only accessible to those users who supply a valid serial number. Of course, if you'd rather do it yourself, Setup Factory is flexible enough to support your own custom validation and authorization schemes. Creating installers for complex and multi-part products is easier than ever. It's a snap to group products and features into a single installer. There's even support for categories so you can group your packages into logical components. It's the ultimate in flexibility for those large projects that need to support different installation types like typical, minimum, complete and custom. Setup Factory offers unsurpassed support for multilingual installations right out of the box. While some products charge you extra for this essential feature (or don't offer it at all), Setup Factory gives you everything you need to support your customers and clients around the world. Installers created with Setup Factory can automatically determine the language of the client operating system and adjust the display of screens and messages appropriately. Whether you need to support English, French, German, Spanish, Italian or any other language recognized by Windows, with Setup Factory you simply provide the text and your installer takes care of the rest! It's never been easier to make sure that typos don't creep into your projects. Basically anywhere you can type, you can perform a spell check to ensure error-free text. Dictionaries are available for over a dozen languages including English, French, German, Italian, Spanish, Dutch, Swedish, Danish, Croatian, Czech, Polish and Slovenian. Keeping track of the essential details of your installation project is just a couple of clicks away. With HTML-based project reports (featuring CSS formatting) and text-based install-time log files, you'll have an accurate record of everything you need. New options let you control the level of detail being logged, including options for recording errors and script actions. Create silent installations that operate without displaying user interface dialogs, prompts, messages or errors. Easily read command defaults from a response file and control the installation automatically. Silent installs let you maintain control over hundreds or thousands of workstations while enforcing corporate standards. New options let you enable silent installs with a command line switch, or even force the installer to always run in unattended mode. Setup Factory installers automatically return command line status codes and can be easily called from batch files and automatic build processes. If you're creating installers for your Visual Basic projects, then look no further! Setup Factory can analyze your VB project and automatically add the necessary runtime files and dependencies for you. There's even an advanced executable scanner that can assist you in determining required DLLs and libraries for those difficult to manage multi-team projects. Setup Factory fits seamlessly into your daily build process. Creating your product installer every time you build your source code makes it easy to test early and often. Simply include your Setup Factory project in your build process to run automatically and output a finished setup.exe. This user's guide is intended to teach you the basic concepts you need to know in order to build a working installer. You'll learn the ins and outs of the program interface and how to perform many common tasks. Each chapter begins with a brief overview and a list of the things you will learn in that chapter. This user's guide follows some simple rules for presenting information such as keyboard shortcuts and menu commands. Keyboard shortcuts are described like this: press Ctrl+V. The "+" means to hold the Ctrl key down while you press the V key. Menu commands are described like this: choose File > Open. 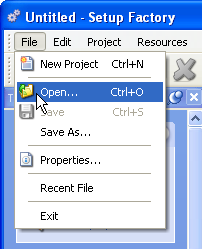 This means to click on the File menu at the top of the Setup Factory program window, and then click on the Open command in the list that appears. When you're meant to type something into a text field, it will be presented in italics, like this: type "Setup Factory makes me happy" into the Message setting. This means to type in "Setup Factory makes me happy", including the quotes.